The Nigeria entertainment circle and fans of Psquare (Peter and Paul Okoye) are still in shock over the sudden death of Psquare's mum Mrs. Josephine Okoye. The late mother of the Okoye's had been ill for some time, and was operated on in an Indian hospital a few hours before she gave up the ghost last night. According to NET, she passed away about five hours after undergoing heart surgery. 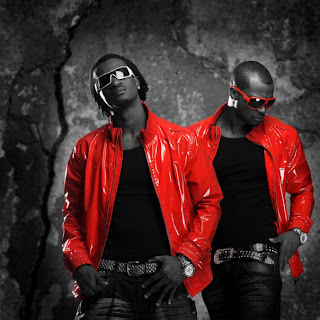 Speaking to NET at his residence, Peter Okoye said their late mother suffered from diabetes. We’re told she had earlier been admitted to St. Nicholas hospital in Lagos, but was flown out of the country when her condition worsened. The atmosphere at Squareville, the Omole Phase 1 home of the Okoye brothers – Peter, Paul and Jude, was somber, less than a day after the news broke. Friends and colleagues of the award-winning singers have been visiting the house to commiserate with the family. A condolence register has been opened, and some of those who paid early visits include their album marketer, T-Joe, producers Flip Tyce and Samklef and TV host Helen Paul-Bamisile. While Peter Okoye opened up his doors to speak with NET, Paul was not seen anywhere in the vicinity. ‘You know that she was a prayer warrior, so I don’t need to tell you how she stood by us spiritually. Besides, she was the only one that believed in us when we decided to make a career out of music. I can remember that she used to sneak us out at night then to attend shows without the consent of our father who insisted that we must quit music to face our education’, Peter recounts. She is survived by her Jos based husband, her children Ifeanyi, Henry, Jude, Lilian, Tony, Peter, Paul and Mary, as well as her grand-children, including Cameron, Peter’s son.